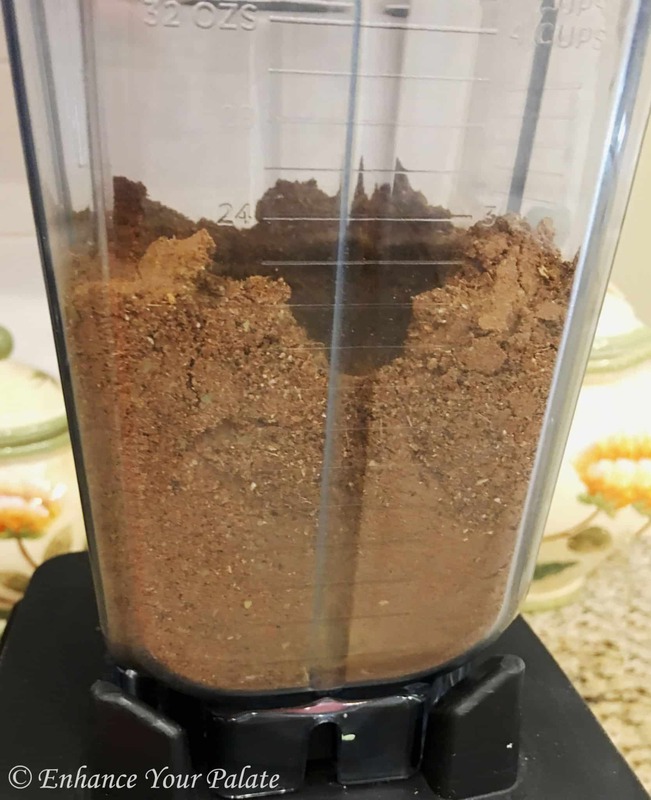 Garam Masala (Warm Spices) is a blend of warm spices commonly used in Indian sub-continent to enhance the flavor of any dish. 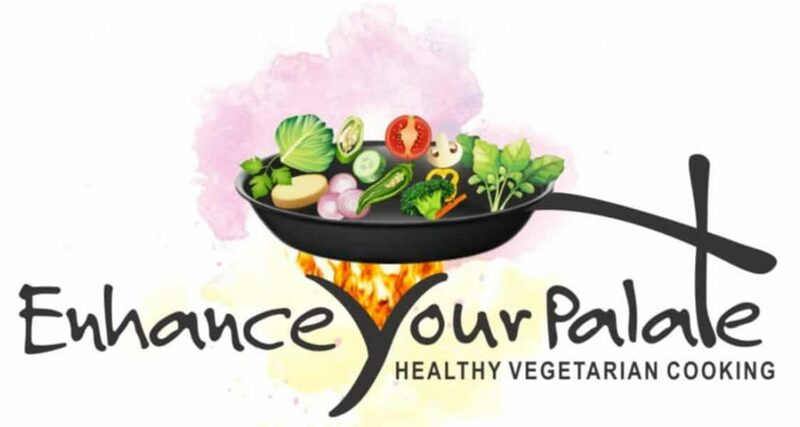 It is an effective immunity builder and pain killer. Additionally, it slows the aging process and increases the body’s ability to absorb proteins, vitamins & mineral in food we eat. Lastly, it also reduces heart burns, bloating and relives gas. Garam Masala is spice is usually added towards the end of recipe, when the dish is almost ready or when it is served. 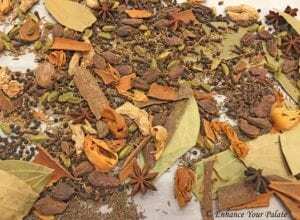 This spice may also be used to enhance the flavors of mocktail, cocktail, teas, coffees, smoothies and also baked items. Possibilities are endless. It enhances the taste of your dish or drink to the next level. Hence, this spice is claiming its spot in the pantries around the world. 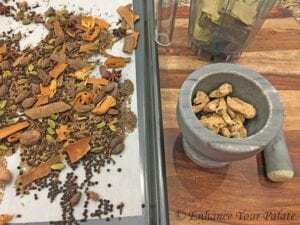 You can buy garam masala in most high-end grocery stores or international grocery stores, however tends to lose it flavors, fragrance and strength after a few days. Hence, it tastes best when made from whole spices fresh at home. This also helps make sure that it is free of any adulterants or additives. You can make it and store it for few weeks if you’d like. This will give you quality assurance and better taste. When you compare the home and market blends, the difference in quality is clearly visible. Most recipes on this website use this spice. 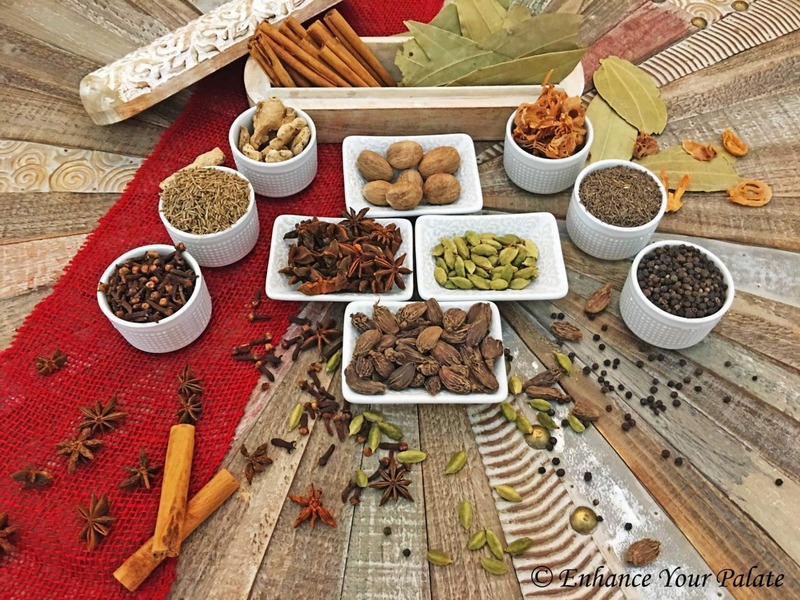 Depending on the regional and cultural preference, the flavor and texture of garam masala may vary from one house hold to another. However, after trying this recipe garam masala flavor, you’ll be hooked. One unique difference is that, this recipe does not use coriander seeds which gives this spice blend a strong flavor. Check all the raw spices to make sure that there are no foreign material (chaffs & husks) in the spices. Next step is to dry the spices. 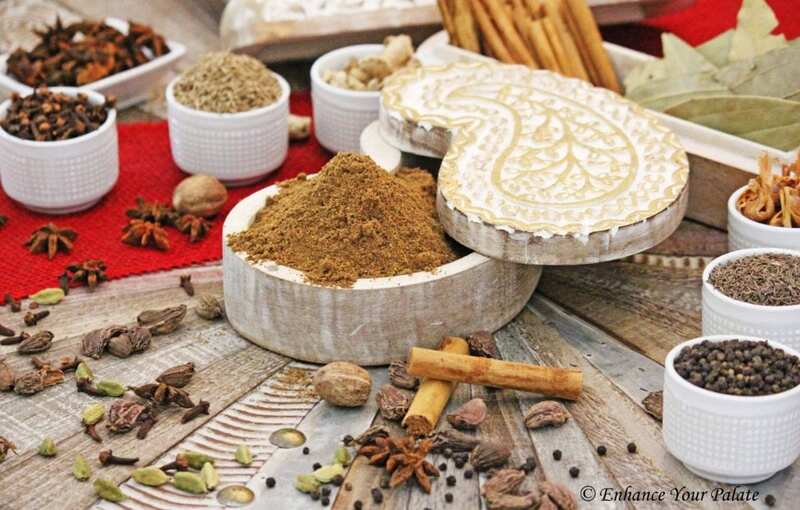 If you live in a warm climate place with lot of sunlight, then you can leave the spices out in the sun for a day. Alternatively preheat the oven to 200oF. Once it reaches the temperature switch it off. Then spread all the ingredients on a baking sheet and place it inside the oven until all the spices are warm. 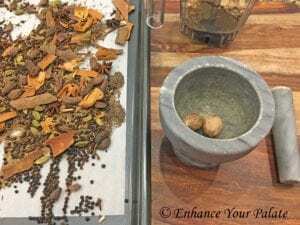 Crush big pieces of spices in a mortar and pestle before grinding. 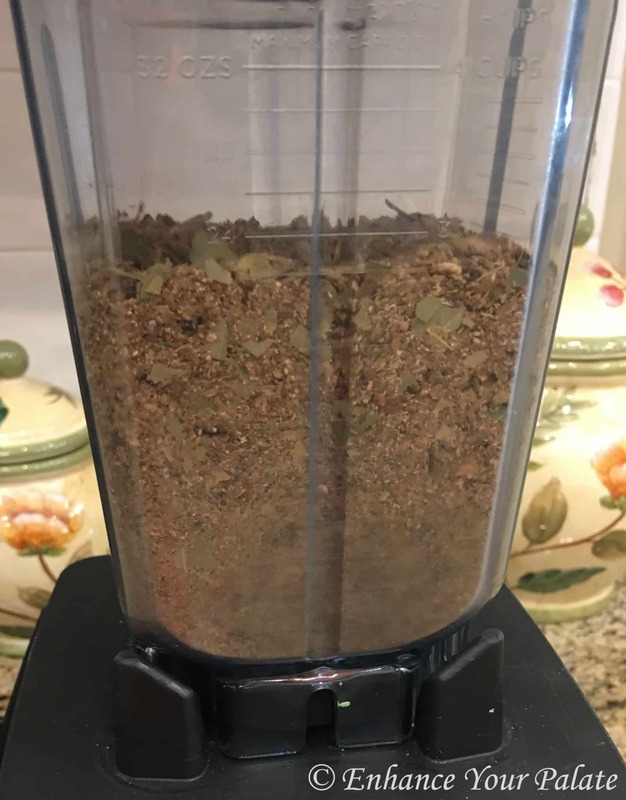 This is to make sure that large and hard spices do not damage the grinder jar. 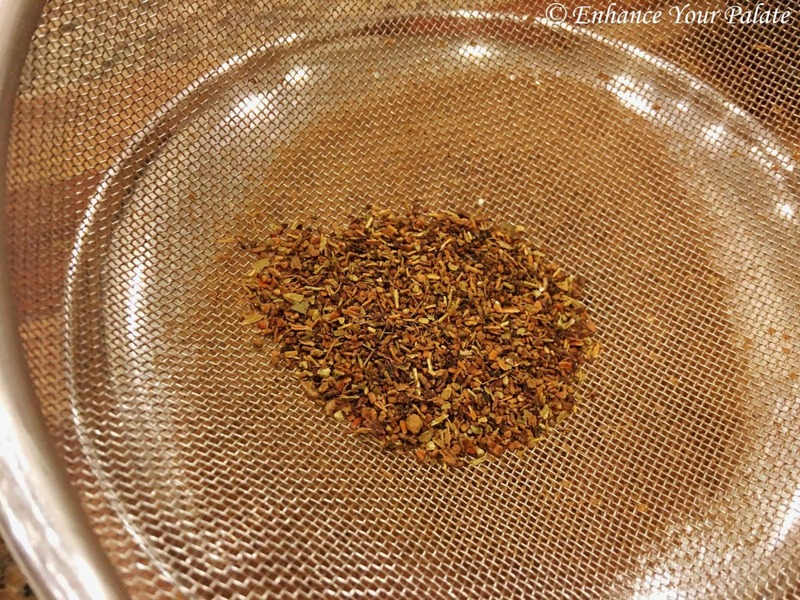 Put all the spices in a dry grinder jar and grind till you get a fine powder. 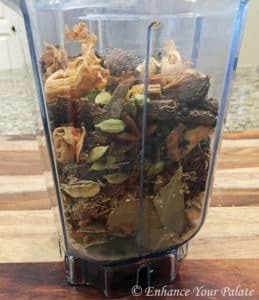 I used Vitamix mixer with dry grains jar. 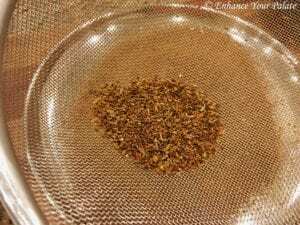 Sieve the ground mixture to separate out the coarse pieces. 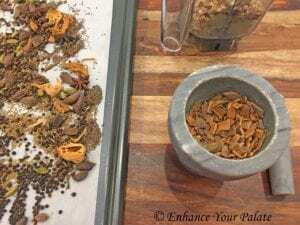 Do not discard the coarse pieces, just reground them or use them in curries that take whole spices. 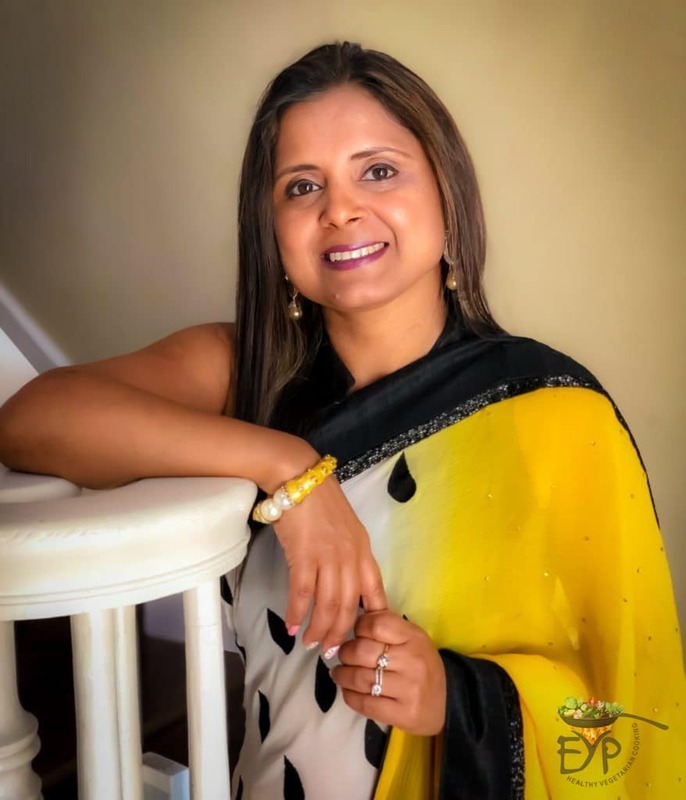 Your garam masala is ready. Store in an air-tight container in cool and dry place. 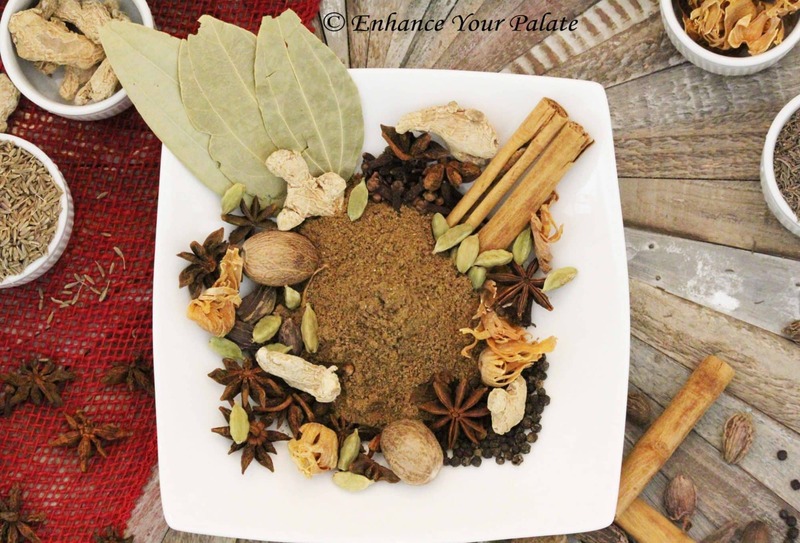 Garam Masala (Warm Spices) is a blend of warm spices commonly used in Indian sub-continent to enhance the flavor of any dish. 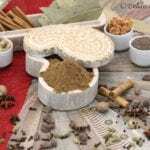 It is an effective immunity builder and pain killer. Additionally, it slows the aging process and increases the body’s ability to absorb proteins, vitamins & mineral in food we eat. Lastly, it also reduces heart burns, bloating and relives gas. 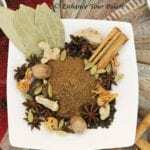 Garam Masala is spice is usually added towards the end of recipe, when the dish is almost ready or when it is served. 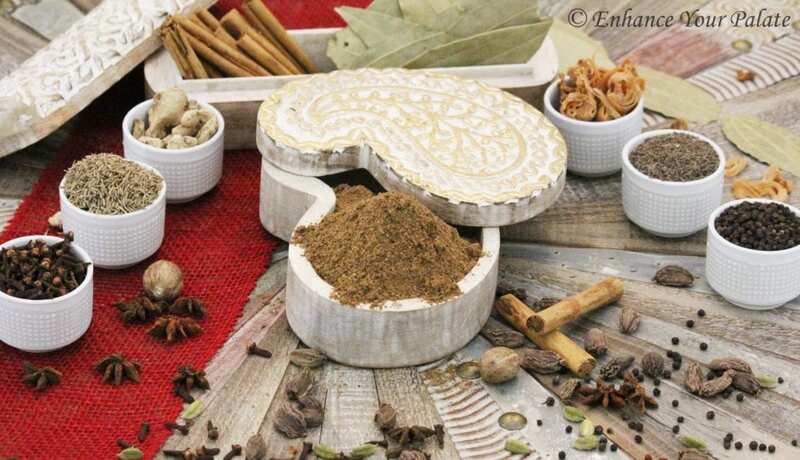 This spice may also be used to enhance the flavors of mocktail, cocktail, teas, coffees, smoothies and also baked items. Possibilities are endless. It enhances the taste of your dish or drink to the next level. 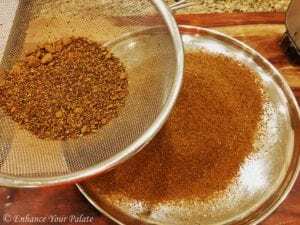 Depending on the regional and cultural preference, the flavor and texture of garam masala may vary from one house hold to another. 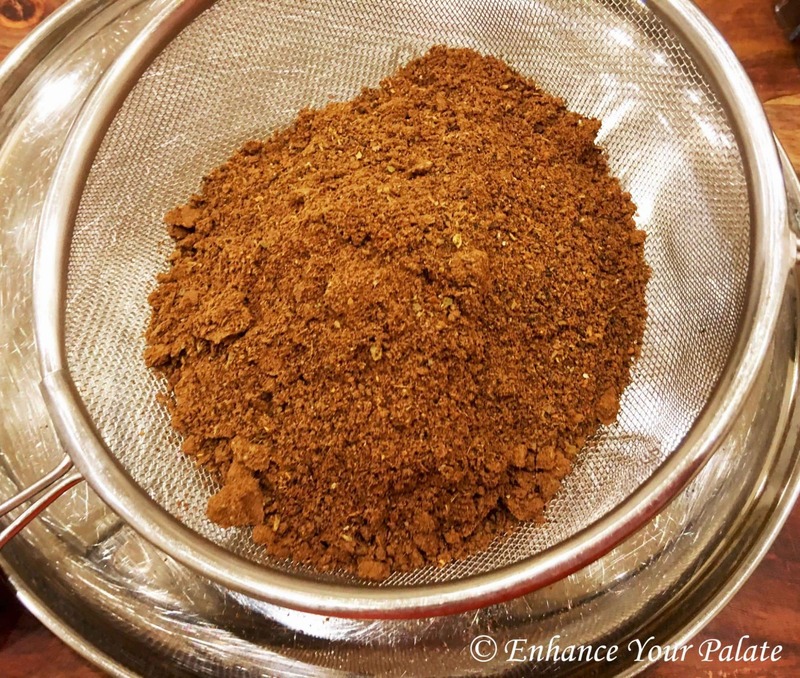 However, after trying this recipe garam masala flavor, you’ll be hooked. One unique difference is that, this recipe does not use coriander seeds which gives this spice blend a strong flavor.